Air Pollution Control System (APCS) is an industrial equipment used to eliminate polluting contents from air released during industrial processing. APCS are majorly used in power generation, iron & steel, chemical and cement manufacturing industries. In Saudi Arabia, the chemical industry sector holds majority of the revenue share in air pollution control system market due to presence of large number of petrochemical and chemical industries. Chemical and petrochemical sectors would continue to dominate the Saudi Arabia air pollution control systems market share over the coming years on account of growing downstream petrochemical industrial activities in Saudi Arabia. Additionally, growing investors' confidence and rise in government spending for infrastructural development are likely to lead to the influx of new industries which would further surge the demand for APCS. The Saudi Arabia air pollution control systems market report thoroughly covers Saudi Arabia air pollution control system market by equipment type, applications and regions. 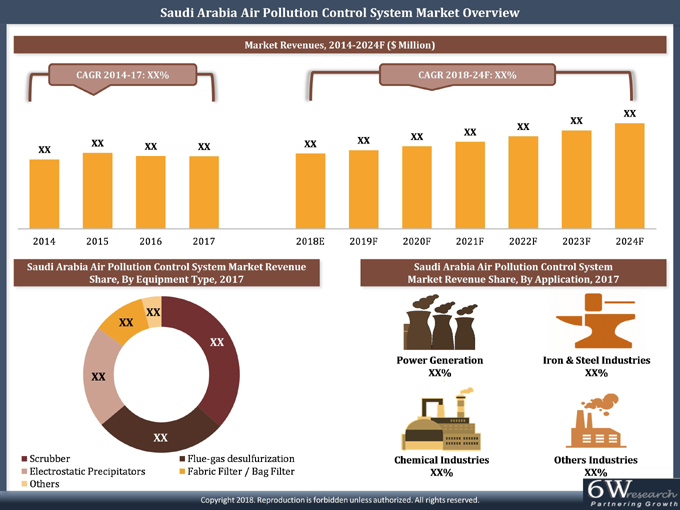 The Saudi Arabia air pollution control systems market outlook report provides an unbiased and detailed analysis of the Saudi Arabia air pollution control systems market trends, opportunities, high growth areas and market drivers which would help the stakeholders to device and align their market strategies according to the current and future market dynamics. • Historical Data of Air Pollution Control Market Revenues for the Period 2014-2017. Systems Market Forecast of Revenues, until 2024. • Historical Data of Air Pollution Control Market by Equipment Type for the Period 2014-2017. • Market Size & Forecast of Saudi Arabia Air Pollution Control Systems Market Revenue, By Equipment Type until 2024. • Market Size & Forecast of Saudi Arabia Air Pollution Control Market Revenues, By Applications until 2024. • Historical Data of Saudi Arabia Air Pollution Control Market Revenues, By Regions for the Period 2014-2017. • Market Size & Forecast of Air Pollution Control Market Revenues, By Regions until 2024. 13.3. GE Power Systems Inc.
13.6. AAF Saudi Arabia ltd.